The Wisconsin Surveillance of Autism and Other Developmental Disabilities System (WISADDS) is part of the Autism and Developmental Disabilities Monitoring (ADDM) Network funded through the Centers for Disease Control and Prevention (CDC). WISADDS is a multi-source public health surveillance project that monitors the prevalence of autism spectrums disorders (ASDs), cerebral palsy (CP), and co-occurring intellectual disability (ID) in 8-year-old children within a 10-county area in southeastern Wisconsin. 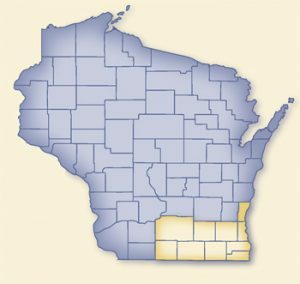 WISADDS also monitors the prevalence of ASDs among 4-year old children within a 2-county area in south central Wisconsin. The information below represents a portion of the results from the 2014 survey of ASD Prevalence in 8-year-old children. A complete factsheet is available here. Part of Wisconsin included in ADM highlighted in yellow, 2014.